This week reports on two south Asian security crises: in Baluchistan and Kashmir; a reconciliation drama in Colombia; Armenia's recent unrest; and sea life a thousand feet down. India and Pakistan have often confronted each other - but each nation also has to deal with domestic security problems. 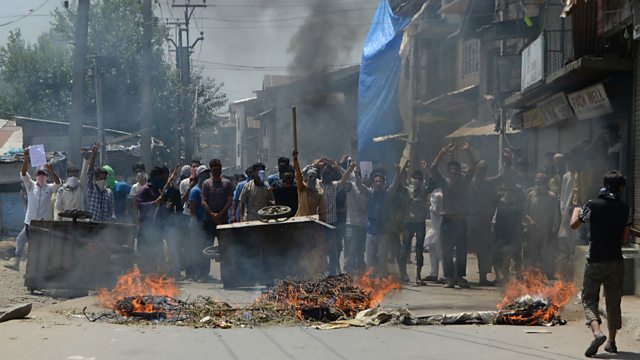 In Indian-administered Kashmir, Justin Rowlatt hears from restive crowds who have been silenced by neither days of curfew nor a news blackout, and witnesses the police tactics used to try and tamp down their protests. Over the border in Pakistan, Shaimaa Khalil explains why the troubled province of Baluchistan is such a headache for central government - and why the violence which plagues it is now being turned against local lawyers. Lucy Ash hears how drama itself can play a role in reconciling Colombians with their past, as former left-wing rebels, ex-right-wing paramilitiaries, and the victims of their crimes meet on stage. Rayhan Demytrie recently saw a different kind of political theatre unfolding on the streets of Armenia's capital, Yerevan, as veterans of the war with Azerbaijan mounted an armed attack against their own state - and were applauded for it by many Armenians. And far from all the madding crowds, Justin Marozzi joins a scientific mission a thousand feet below the surface of the Sargasso Sea hoping to unlock some of the mysteries of the deep ocean.